Though it might seem an odd place to drop by for a stroll, the Historic Jacksonville Cemetery is one of the area’s most beautiful spots. The hilltop burial ground is shaded by mossy trees and offers a spectacular view of Jacksonville. The cemetery itself has its own appeal. It is filled with gorgeous headstones and monuments, some dating all the way back to the mid-19th century when the cemetery was founded. Many of them have unique and often tragic stories to tell. The setting lends itself to the contemplation of perspectives beyond the mundane. The Historic Jacksonville Cemetery is the final resting place for many of the town’s previous residents, and is home to Jacksonville’s history. A walk through the headstones is like taking a stroll through time. 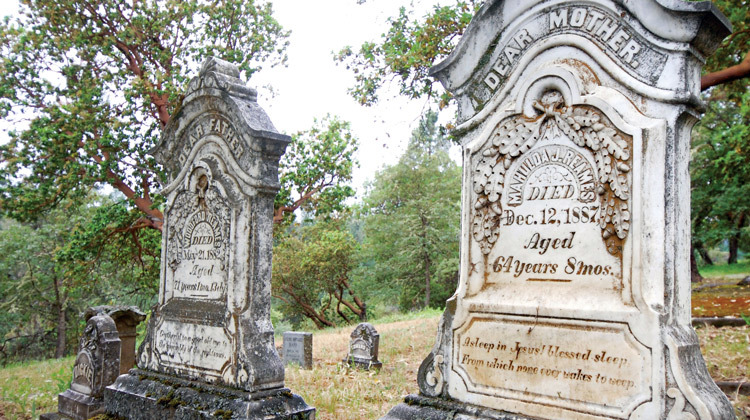 Grave markers commemorate the lives and deaths of citizens and soldiers, pioneers and pastors, town fathers and miners. Many of the people who helped to build Jacksonville are buried here, including miner turned photographer Peter Britt (the first person to photograph Crater Lake); William Green T’Vault, who ran the first town paper, The Table Rock Sentinel; and carpenter David Linn, who produced such diverse goods as furniture, mining equipment and baseball bats. Also interred here are members of various noteworthy social and civic organizations.